Back flips, highlight-reel catches, and clutch postseason performances made Ozzie Smith the best St. Louis Cardinals player of his generation and arguably the greatest defensive shortstop in the history of Major League Baseball. These memorable traits earned him the well-deserved nickname "The Wizard of Oz." After winning 13 consecutive National League Gold Glove Awards, he became the standard to which all modern defensive shortstops are compared. This list of Ozzie Smith baseball cards examines ten must-haves for your collection. Shop for Ozzie Smith Cards on eBay. Ozzie Smith first made an appearance on a traditional baseball card in 1979. 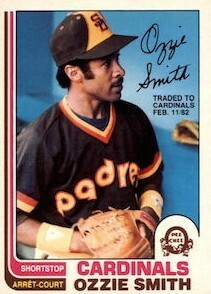 Following a successful rookie year with the San Diego Padres, Smith finished second in the National League Rookie of the Year voting. His Topps rookie card has long been considered one of the best cards from the 1970s and is still widely sought after by collectors of all ages. The St. Louis Cardinals traded for the Gold Glove shortstop following the 1981 season to anchor the infield of their "Whiteyball" era teams, which were built on pitching, speed, and defense. Ozzie helped the team win the 1982 World Series and two other National League pennants, cementing his place into Cardinals' history as one of the team's all-time great players. This success also lifted him up in the hobby world as one of the elite collectable players from the 1980s. Because Ozzie Smith is still appearing in current card products as the subject of base cards, inserts, memorabilia cards, and autographs, his card totals continue to grow. However, a few of these choices stand out for collectors. Below is a top ten list of important Ozzie Smith cards that stretch the entire span of his time on cardboard, from his rookie year to a few cards later in his career, and post-retirement. 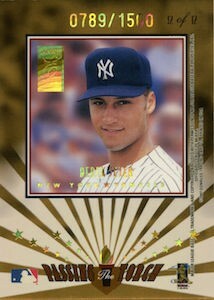 The Wizard's first appearance on a memorabilia card came in the 1999 Upper Deck Century Legends product. While this product is best known for an incredible selection Hall of Fame autographs, it also features a solid line-up of memorabilia cards featuring players who are already in the Hall of Fame, or will be there shortly. That includes a game-worn relic card for Smith. One of the earliest certified autographs of Ozzie Smith was featured in the final edition of the Donruss Signature product as an exchange card. With a print run of 2000 copies, this card is not a hard find, but it is still an attractive signed card for the Hall of Fame shortstop. 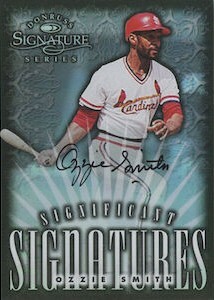 Ozzie has a legible and neat signature, which really pops out on this card's design. Passing the Torch inserts feature single-sided cards of individual players and dual-sided cards of different veterans paired with younger stars of the game. There are many great names and cards in this 1997 set, but for Ozzie Smith collectors, there is a dual card shared with future Hall of Fame player Derek Jeter. While the base version is serial numbered to 1,500 copies, collectors with a bit more money to spend on Ozzie Smith can search for the elusive autographed parallel that is numbered to just 150 copies. The Kellogg's cereal cards were sort of a precursor to the Sportsflics cards which showed up during the latter half of the 1980s. These mini cards were a staple of cereal box giveaways every summer during the 1970s and early 1980s. 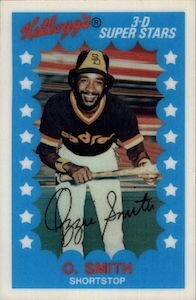 This was one of the last Ozzie Smith cards featuring the Hall of Famer wearing the sweet brown, yellow, and orange Padres' uniforms. 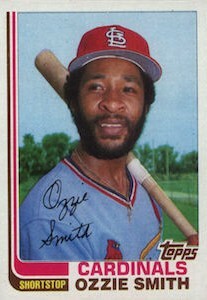 1982 OPC included the first official Ozzie Smith cards as a member of the Cardinals. 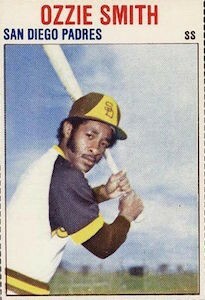 The regular 1982 Topps set features the same picture, but the bars on the left hand side of the card were brown and green and obviously the team info at the base of the card was still a Padres label. "Traded To" stamps were commonly found on Topps cards during the 1980s. Obviously the Cal Ripken rookie is the top card in the iconic 1982 Topps Traded set, but the Ozzie Smith card is also fairly important. 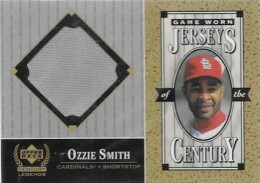 Raw copies of the card are still popular with Ozzie Smith collectors today and the card is also a top option for graders. Adding to the significance, The Wizard also helped the Cardinals win their tenth World Series title during the 1982 season. 1993 Finest was one of the most innovative products at the time of its release with the introduction of the Refractor parallel card. 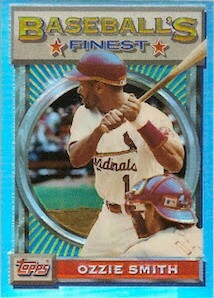 Ozzie Smith was featured in the inaugural Finest set, and like all the Refractor subjects in the product, is a popular target for player collectors and card graders. Only about ten percent of the PSA population for the Ozzie Smith Refractors have come back as Gem Mint 10s. 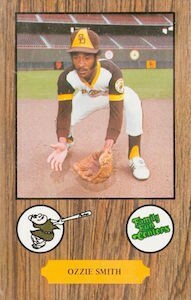 This Ozzie Smith pre-rookie card hails from a promotional giveaway set the Padres issued during the summer of 1978. The postcard-style set features a wood border that is slightly reminiscent of the 1962 Topps set, and is very collectable with a low population of high-grade copies. 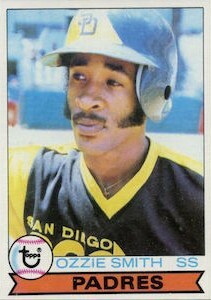 The Padres also issued similar sets in 1979, 1980, and 1981. 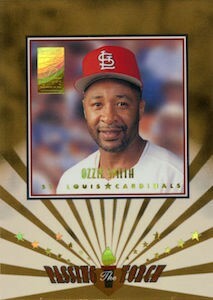 The 1979 Hostess Ozzie Smith card is a frequently overlooked rookie-year card of the Hall of Fame shortstop. The card is not only tricky to find, but it is also a condition sensitive card. Like most of the Hostess cards from this era, the cards feature perforated edges, which often means many examples are in rough condition. Mint copies are a rarity. The 1979 Topps Ozzie Smith card is one of the most iconic rookie cards from the 1970s. Lamb chop sideburns, a mustache, and a brown polyester Padres uniform would make this a cardboard classic regardless, but add in the fact that this is the first card of one of the greatest defensive players to ever step onto a baseball diamond and the card becomes legendary. Copies of this card were popular with collectors throughout Ozzie's Hall of Fame career, and have remained a top find with baseball card enthusiasts after his retirement as well. Collectors can also track down the O-Pee-Chee version of this card, which is a little tougher to find, especially in good condition. I have a post 1993 collectors series baseball card of ozzie smith, st. Louis cardinals shortstop card, i cant find out noithing about, is it worth amything?